While January and winter weather means an end to gardening activities in many parts of the United States, it is prime time to plant in southern California. Plant fruit trees: A variety of bare root fruit trees are at nurseries ready to be planted in January. Varieties include apricot, blueberries, plum, apple, pear, peach and raspberries trees. Give the trees a boost by adding organic compost planting mix to the soil to increase soil aeration and to keep in moisture. 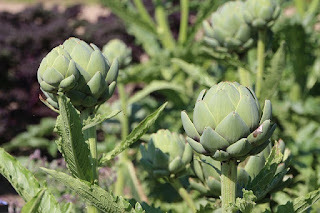 Add Artichokes: Add artichoke plants to your garden. Plant them 4 feet apart. They start their growing process in winter and begin sprouting artichoke heads in spring. These hardy, perennial vegetables can produce artichokes year after year. Plant Garlic Cloves: Separate cloves from a garlic bulb. Plant them with the pointy part up the clove up--and about 7 to 8 inches deep. Garlic plants will soon poke their heads from the soil and grow during winter. They can easily withstand cold winter nights. The new garlic bulbs with their juicy cloves will be ready for harvest in late spring or early summer. Keep Applying Mulch To Cut Down On Weeds: Every rainfall (no matter how infrequent) means more weeds in the garden. Weeds seem to go more quickly than any vegetable or flower plant. To keep weeds under control, make sure you have a several-inch layer of mulch wherever weeds may appear. If weeds are already taking root, remove them before covering the area with mulch. Plant Wildflowers From Seed: First, rake the flowerbed area. Sprinkle California poppy and other wild flowers and cover gently with soil. Sow more seeds just before a rain to encourage continued flower production in spring. Move Living Christmas Trees Outside: Living Christmas trees should stay indoors for as little time as possible. Once planted outdoors, pine trees can easily grow 40 to 50 feet tall. Their strong root system, over time, will spread and can easily crack concrete walkways that stand in their way. Make sure you plant your tree in a location that can accommodate such a large tree. Purchase A Rain Barrel: Don't let rainwater roof runoff go to waste. Many cities and counties offer rebates when purchasing rain barrels. These barrels can typically hold 50 gallons of water--water that can be used to irrigate your garden. For more gardening tips, go to www.agromin.com.